Should You Get a PSA Blood Test? My brother-in-law was seemingly the healthiest person I knew. He never even got a cold, so he rarely saw the doctor. Luckily he got a complete checkup when he turned 50, because it turned out that he had aggressive prostate cancer. Standard screening, to find prostate cancer in people who don’t have symptoms, allowed him to be treated in time. Standard prostate cancer screening consists of a digital (finger) rectal exam to feel for prostate abnormalities and a simple blood test that measures the amount of prostate-specific antigen (PSA) in the blood. PSA is a protein produced by the prostate gland that is present in small quantities for healthy men, but it’s generally evaluated for men with prostate cancer and other prostate disorders. The goal of PSA screening is to detect prostate cancer early, so it is easier to treat and more likely to be cured. 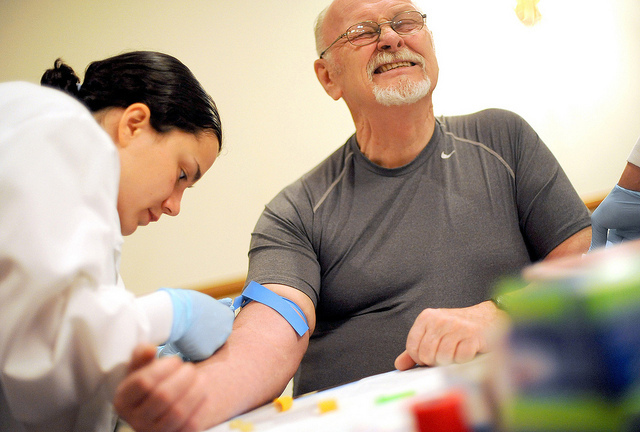 So why has PSA screening recently become so controversial when it’s just a simple blood test? The main issue is that PSA screening isn’t good at distinguishing between aggressive life-threatening prostate cancer and slow-growing prostate cancer that may never spread. So it may lead to unnecessary side effects from overtreatment of slow-growing prostate cancer, including a risk of incontinence and impotence. This controversy escalated in May 2012 when a government panel of health experts called the U.S. Preventive Services Task Force (USPSTF) recommended against PSA-based screening for prostate cancer for men of any age, stating that the benefits of screening don’t outweigh the harms of overtreatment. The USPSTF based its recommendation primarily on the two largest published randomized clinical trials that evaluated the effectiveness of PSA screening. The first is the U.S. Prostate, Lung, Colorectal and Ovarian (PLCO) Cancer Screening Trial in which 76,685 men aged 55 to 74 years were randomly assigned to receive either annual PSA screening or “usual care.” The study found that slightly more prostate cancers were found in the PSA screened group, but the number of people that died from prostate cancer were about the same for both groups. Hence, it raised the question of whether men were harmed from overtreatment of cancers that weren’t life threatening. However, this PLCO study is inherently flawed because 52% of the “usual care” control group also received PSA screening and 40% of the study participants received PSA screening before enrollment in the trial. Since so many men in the “usual care” control group received PSA screening, it’s not surprising that the prostate cancer mortality rates were the same for both groups. The USPSTF also based its recommendation on the European Randomized Study of Screening for Prostate Cancer (ERSPC) that randomly assigned 162,243 men aged 55 to 69 years to either PSA screening once every 4 years or an unscreened control group. After correcting for patients that did not follow the protocol-prescribed screening procedures, the ERSPC found that PSA screening actually reduced the risk for dying of prostate cancer by 31%. Many argue that this demonstrates that PSA screening has a significant benefit, so it’s unclear how the USPSTF considered these results in their benefit to harm analysis. A journal article published in the July 2012 issue of Cancer supports the view of this ad hoc group. Researchers at the University of Rochester Medical Center used data from the Surveillance, Epidemiology and End Results Program to estimate the total number of men in the current U.S. population who would have metastatic prostate cancer at initial diagnosis if PSA screening weren’t used. Such metastatic prostate cancer is usually rapidly fatal with a median survival of less than 1 yr to 2.6 years, depending on age. The study found that there would have been 25,000 men presenting with metastatic disease in 2008 in the absence of PSA-screening, instead of the 8,000 men that were actually observed using PSA-screening. So the uncertainty and controversy about PSA screening continues despite extensive research. Since I work in the field of prostate cancer research, friends and family members have asked my opinion. It seems to me that the new screening guidelines against PSA testing assume that ignorance is less stressful than having faith in your doctor; specifically, it’s better to not even perform a simple PSA blood test because patients with low PSA levels are often over-treated. Why not just change how to treat patients with low PSA levels and repeat the blood test in 6 months to a year to see how quickly the PSA level rises — since prostate cancer is more likely to cause a rapid rise in PSA levels? Is this common practice of “watchful waiting” by your doctor really more stressful than not having the blood test at all? For some, that simple blood test could also indicate that you have aggressive prostate cancer that has spread and needs immediate treatment. For more information about PSA screening, check out my KQED Quest blog. Author Jennifer HuberPosted on September 7, 2012 September 16, 2012 Categories HealthLeave a comment on Should You Get a PSA Blood Test?